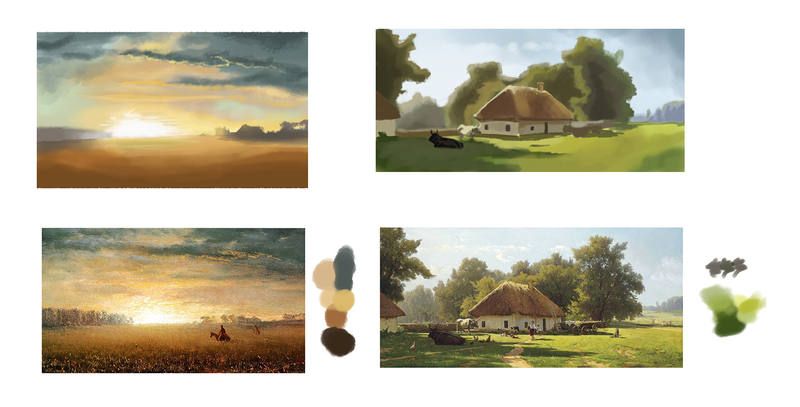 This entry was posted in Sketchbook and tagged Colour, Master Studies. Bookmark the permalink. How do you usually start picking colors? I read through the color theory, and yet when it comes to putting things together, I tend to make a very boring blend, or something that I can’t stand looking it for more than 1 second. I know what you mean! It rarely ever turns out well when I try to stick to some hard and fast rule. Definitely haven’t found any Holy Grail yet but I find that thinking about creating focus is a good guide. What’s the main colour/emotion you want in a composition? Make that your focus and then every time you choose another colour, think about how it relates to your main colour. Do you want to highlight the main colour by contrasting it with another colour, or soften it with a supporting colour? Then I kind of add colours in one at a time and make adjustments as I go (I’ve been doing that in my UI designs lately and it’s been working well for me). You can still use those complementary, analogous, trichromatic schemes, but it’s you and your experience/taste that decides exactly which colours within that range fit the effect you want to create.